I have some footage I shot that I would like to add sound too but I am totally baffled as to how to do it. When it comes to Final Cut Pro I am a total neophyte. I shot using a Canon Scoopic MS. I shot it on 24fps. I then got my footage processed and then transferred to HD 1080 @ Pro Res. I recorded audio from the day using a ZOOM H4N but it my stupidity I forgot to put the windscreen on my H4N, so the audio footage has a lot of what I call blow-outs from the wind. I asked my friend to re record all the songs from that day and I have all the songs re-recorded. The problem I am running into is how to sync the footage with the newly recorded audio. I should of gotten my camera modified by the film group to shot shoot crystal sync but at the time I could not afford it. The 24 fps marking on the Sccopic MS is probably not exactly 24, correct? However once I got my footage digitally transferred to HD wouldn't the frame rate change? 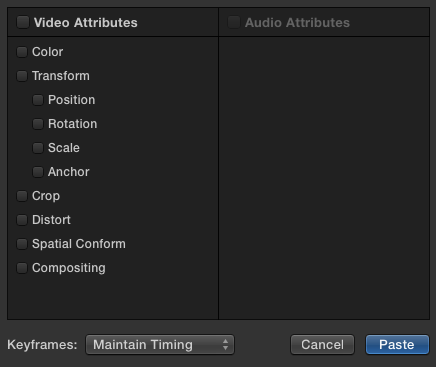 Basically I am asking how can I change the footage frame rate in FCP so that I can match it up with my audio? Can I play with the colors? My main goal is to sync the audio with the footage. I almost matched the audio with the footage but it comes undone at some point and then is out of sync. I did this in the crudest manner just by moving the audio to the point where the musician starts playing the guitar. I normally edit in camera( i started out using super8 and really dig the straight8 thing but I now I ready to actually EDIT). I plan on learning how to edit the original way, splicing and taping/glue/film cement my film but I acquired some computer programs and really need to learn how to use them, I also plan on taking some courses in the various programs (after effects/fcp x/ compressor/etc). For now I figure I come here and ask. Please excuse my ignorance/stupidity. I just acquired these programs as a gift but I am computer illiterate. Did he record the song to some sort of click track? If the tempo is even the slightest bit off it won't sync properly. It would have to be at exactly the same and steady tempo. That being said, the way you fudge it is but adjusting the "re-timing" on the clip. Basically slow down and speed up each clip until it looks right. I'm guessing you're using Final Cut Pro X? If so, just it the option-R (or command-R…not sure which) then a green bar will show up above the clip that you can then drag longer and shorter to speed up or slow down the clip. By the way, crystal sync on a Scoopic is nice but isn't completely critical to your application. As long as you can cut up the performance into smaller clips you should be able to adjust…and if the new audio performance at least matches the tempo of the filmed one; if not it will take much trial and error of speed adjustments on the clips. The problem is that, without crystal sync, the camera motor never runs at exactly 24fps, or any constant speed for that matter. Sometimes it runs a little slower, sometimes faster. So when you go to try to synchronize it with something that was running at a constant rate, i.e. an audio recording, it will never sync properly. You'll be able to get one point in sync, but the audio will always drift after a few seconds. You can make a sync marker (clapper board or some other sync point) at the head and tail of each take. This will allow you to adjust the playback speed of either the audio or video in order to synchronize to those two achor points, which may get you close depending on the length of the take and steadiness of the camera motor, but it's never going to get you a hard sync. Hope that helps! Sorry, I forgot to answer your other questions too! Click on the cropping tool. The dropdown triangle next to it allows you to select the type of cropping: Trim, Crop, or Ken Burns. 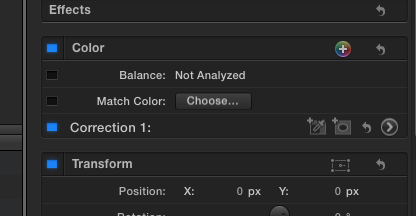 Under "Color", where it says "Correction 1:", click the triangle icon all the way on the right. This will bring up the Color Correction Window, which allows you to adjust hue, saturation, and exposure levels for your shadows, mids, and highlights. And here's a real time-saving tip. If you've adjusted a video clip, either with color correction or effects or cropping, and you want to paste those attributes into a other clips, select the source clip you want to copy, copy it with Command+C, then select the clip or clips you want to paste the attributes into, and press Command+Shift+V. This window will come up, allowing you to select which attributes you want to paste into the selected clip(s). Hope that makes sense! Good luck!! Thank you both so much for your quick and informative responses! I will post a link to what I have done, it will probably be poor but its my 1st attempt at syncing sound with 16mm but certainly not my last. You could have your friend play along while listening on headphones to the damaged audio; it'll allow him to play in time. But with a non-crystal sync camera, you'll probably still need corrections. @ Phil: Thats what I am gonna do along with the information/instructions Josh gave me.